Three jaws to bite them. One king to fight them. On those who chance its fate. Beware the cracks of doom. As the scorpion tightens its grip on the Guardian Kika with its pincers, Kika manages to fumble for her blowpipe without alerting her captor. The scorpion glowers gleefully as it squeezes its prey to the point of collapse, but before it can deal the final blow Kika wriggles her arms free and uses her last breath to blow a dart into the scoropion's left eye, killing it through its brain. Kika drops to the ground as Richard and Orkan struggle to reach her through the wave of scorpions, their weapons blunted from the creatures' tough armor. Kika orders her friends to hide, and abruptly takes to the air, out of reach of the scorpions. Taking her advice, Richard leads his friends through the fray and down a main streeet. The eventually find themselves in a very narrow alleyway, a growing sandstorm hiding the pursuing scorpions from their sight. When Orkan inquires about their next move, Richard states they need to get the pod before wasting anymore time. Melek pulls out the Path Finder and Richard uses it to find the golden tipped direction. As the trio heads in the indicated direction, the scorpions howl with rage as the sandstorm confuses them. 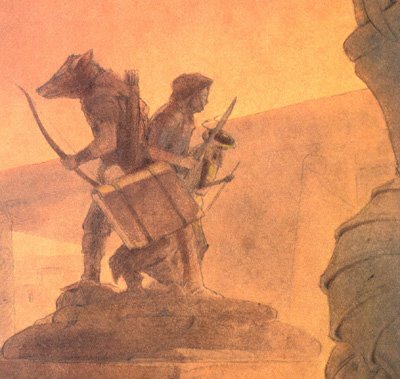 Soon, the trio reach a large deserted square in the middle of the city, flanked by columns and statues all around. Kika suddenly drops down from the sky, and Richard tells her he believes the pod is located somewhere within this square and a secret entrance must exist somewhere. After a search of the square, the group finds a plinth missing a statue. Believing this to be the secret entrance, the group searches for a possible entrance mechanism before Richard notices a ball sitting on the edge of the plinth. He bends down and gives it a firm push, and the plinth beneath them starts to sink and tip forward. Richard, Orkan and Melek find themselves landing in a huge pile of sand in a vast underground chamber, while Kika glides to the bottom to join her friends. The chamber is most certainly Cobra's Keep, as it is decorated with statues and carvings resembling snakes. At the other end of the chamber, Richard notices a large unidentifiable mound half-hidden by the shadows, and decides to investigate. But before he could move forward, the mound stirs as the mass takes the shape of a giant snake with three heads. Kika confirms that the beast is Dragora, the three-headed cobra. Dragora lunches with quick reflexes towards the group, lashing out at three separate targets. The group manages to scatter, though one of Kika's wings are pierced by one of the monster's black tongues. Orkan responds by firing several arrows at the beast, and one arrow manages to pierce one of Dragora's heads, sending it into shrieks of agony as the other two heads continue to attack. One head locks onto Melek and manages to sink its fangs into the scribe, but luckily the fangs only enter the Book of Prophesies and don't even scratch the scribe himself. As Melek struggles to escape, the spine tears apart and Melek doesn't notice the Path Finder falling out of its protective sleeve. Dragora's prey soon proves too quick for her to handle. Orkan kills another head with his arrows and Kika slows it down with a barrage of darts. Eventually, one of Orkan's arrows sinks into the cobra's single heart and Dragora falls to the ground, dead. With the beast slain, Richard asks Melek for the Path Finder. The scribe discovers in horror that the instrument is missing, and Richard quickly tells his friends to look for it. The four split up and scour the floor of the Keep for the instrument, shuffling their feet in the sand. Suddenly, Orkan exclaims excitedly for his friends to get to his side. Richard thinks Orkan has found the Path Finder, but instead Orkan has found an iron grate in the floor, beneath which he can see something moving in a large pit. Intrigued, Richard and Orkan removed the grate and wait for something to happen. Then, a large lizard crawls out of the pit before wobbling around the room. 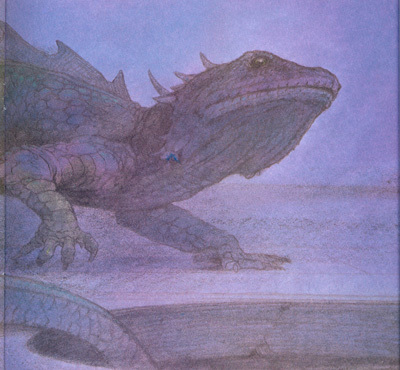 As more lizards emerge from the pit, Kika states that they were the reptile forces of the Guardian Zard. While watching the reptile forces emerge from the pit, Richard notices the heat inside the chamber is starting to rise noticeably. Even Kika's wings were beginning to wilt. She explains that Dragora is triggering the rise in heat - with her dead, the lifeforce she sucked out of Sand City was being released. where winter solstice White brings Ice and snow. and shuns the Yellow swamp of Wastes' despair. round campsites Orange tongues will wage in Fire. and Brown caves weave in secret, Underland. through Black skies loom in silent dark of Night. and leads to Good, when journey's end is near. Realizing the colors respond to different locations, Richard renews his idea to search Dragora, where the instrument pointed golden. He and his friends search the already decaying carcass, thinking it might be in Dragora's coils, but when Richard looks up he sees a familiar purple glint in one of Dragora's mouths. He discovers the pod sitting in Dragora's teeth, as hinted in the prophecy. Meanwhile, Orkan makes his own discovery: an amulet hanging around one of Dragora's necks. He considers telling his friends about his find, but he doesn't as a strange urge overcomes him. As if lured in a dream, Orkan removes the amulet from the beast's neck and slips it around his own, hiding it beneath his clothes. Richard states that they need to find a way out of the Keep before the rising temperature cooks them, and the group begins searching. As they search, Orkan fingers the amulet, glad he had taken it and considering telling his friends about it one day. But then he considers whether they really are his friends? Weren't they simply using him as expendable muscle? He vows to slip away at the right time so he could make his own fortune. Suddenly, the earth begins to shake and the chambers' decorations start to crumble all around them. The group looks around in horror, while the lizards scatter in panic. A piece of ceiling misses Richard and Orkan as Orkan looks at his companion and laughs wildly, claiming there is no escape from this chamber. 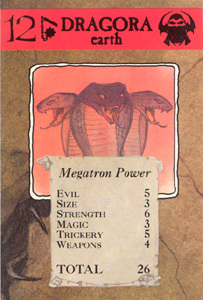 Dragora is a monstrous three-headed cobra that lives beneath Sand City in a chamber known as Cobra's Keep. While she doesn't control the scorpions that guard the ground levels of the city, Dragora does maintain a hold over the city by feeding off of its lifeforce. She is also the creature chosen by the Evil One to guard the lizard forces of Zard, as Enlil did for the Common Beasts. "Even as he spoke, Richard heard a slithering rustle coming from the mount. It had begun to change shape. A tail curled around an elaborate throne. Then three monstrous heads rose into the air, their hoods spread out, casting evil black shadows across the room." The Reptile Forces are the reptilian armies of the Ancestral World, led by the Guardian Zard. 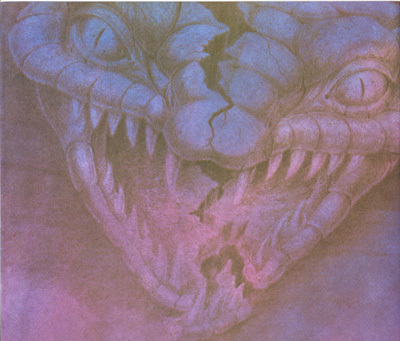 After the final battle with the Evil One, the remaining Reptile Forces were captured and taken to Cobra's Keep, where they were placed into a hypnotic trance by Dragora, just as the Common Beasts were with Enlil. When Dragora was slain, the spell over the Reptile Forces was broken. The thirteenth issue of The Ancestral Trail proves to be a lucky one as Richard and company manages to find another Life Force Pod, making it the third Pod found. Now all that remains to be seen is which Pod the third one will be, and a clue will be provided in the next issue, as they were for the previous two pods. Regarding the story in the issue itself, there are some things to enjoy, and there are some moments to regard as lost opportunity. For the former, it is nice to see the emerging possibility of one of the "good" team members not be so good after all. True, Orkan's strange behavior is seemingly shifted after he put on that pendant - similar to one worn by Enlil to control the Common Beasts - but the fact that Orkan may not be as reliable as he has been thus far proves to be an intriguing idea. As for lost opportunities, the battle between the heros and Dragora was over a bit too early. After giving Dragora a head start at attacking, the group were then deemed too quick for her and she died without much trouble. While it does show that not all creatures, no matter how monstrous, are close to immortal, it does lessen the impact of the creature's appearance just the same. Also, this issue was the one that finally introduced the instructions to the Path Finder. Unfortunately, it comes a little too late, as Richard had already seemed to previously use the Path Finder correctly without worry. If the Path Finder had caused a terrible accident somewhere in a previous chapter, then these instructions would've felt more important than they do now. Finally, the cards that relate to the two beings in this issue again demonstrate the discrepancies between the card art and the book art in some cases. 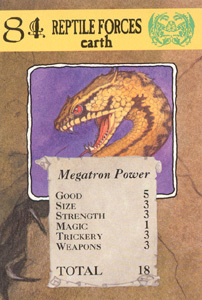 Dragora's card shows a brown snake creature, while in the book her scales are darker and more purplish. 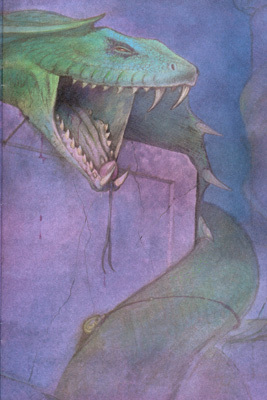 Meanwhile, the Reptile's Forces card shows a creature that is never seen in the book at all, and it is assumed at the moment that all of Zard's forces are composed of lizards, not snakes. Orkan: "Well, what do we do next?" Richard: "Look at the Path Finder! We've got to go for the pod. We mustn't waste our time and energy fighting." "I don't like the look of that. I'm going to investigate." "Zard's reptile forces. Our numbers grow." "It's Dragora. Her power sucked the lifeforce from Sand City, and now she's dead, it's being released. We've got to move fast. This place is becoming an inferno."